In the wild, fish such as salmon or trout eat crustaceans or insects with natural pigments that lend their flesh a pink or red tint. Fish raised in ponds or sea pens, however, receive no such natural coloration. Their flesh is often pale pink or even gray—not so appetizing to consumers used to a healthy pink. Fish farmers routinely add dyes derived from petroleum to the fish’s feed to mask this lack of wild coloration. But researchers think they’ve found a better way to procure these colorful edible additives. Rather than making dyes from petrochemicals, they’re growing the colorants in genetically modified tomatoes. Marilise Nogueira, a graduate student at the Royal Holloway, University of London who led the project, says the goal was to find an alternate way to produce ketocarotenoids, the class of colorful compounds used to dye fish, in a way that doesn’t rely on environmentally harmful petrochemicals. The enterprise says something about the cultural and scientific moment we’re in—turning to genetic modification to replace a petroleum-based product that is used to compensate for the removal of a natural process. Humans have been dying foods produced by farmed animals for centuries or longer—often for similarly deceptive reasons. Butter, for instance, was routinely enhanced with annatto, a yellow dye derived from the seeds of the achiote tree. While undyed butter fluctuated in color, becoming more or less yellow depending on the time of year and diet of the cow producing it, using annatto extract allowed farmers to establish the color of “good” butter. Color was also added to cheeses and prepared meats such as sausages. By the 1900s, organic dyes made from edible substances such as annatto, spinach, and saffron were largely superseded by synthetic dyes, which are cheaper to produce and more consistent in quality. In the past few years, however, society has been shifting back from synthetic dyes to plant-derived ones, says food historian Ai Hisano from Kyoto University in Japan. Hisano sees the tomato-derived fish dye as fitting in with this shift, though in a very modern way. Whether the genetically modified tomatoes are part of a dystopian vision or just the latest in a long line of agricultural deception, the work required some clever manipulations of the tomatoes’ genes to get the dyes required. Naturally, tomatoes produce similar dyes called carotenoids, which give them their signature red color. But tomatoes do not make these compounds in high enough concentrations to make them a viable colorant for fish feed. So, using a variety of tomato called Moneymaker that had been genetically edited to add bacterial DNA associated with producing ketocarotenoids, the researchers engineered a tomato to make those different colorful compounds. But the gene editing by itself wasn’t enough to get the necessary high-yield tomato. It took an old-fashioned gene editing technique known as “gardening” to get the results they wanted. The researchers crossbred their modified tomatoes with a variety that is extra high in beta-carotene, a carotenoid that is naturally occurring in tomatoes. (That second variety was itself a crossbreed of two tomatoes: the domesticated garden tomato and the wild Galapagos tomato.) The combination of the two lines of tomato yielded a tomato that produced high levels of ketocarotenoids. The researchers grew their modified tomatoes in a closed greenhouse in the United Kingdom. The tomatoes were then freeze-dried and shipped to Germany, where they were powdered and mixed into the feed for farmed trout. The scientists found that the fish absorbed roughly twice as many ketocarotenoids from the tomato feed as they did from an equivalent amount of petrochemical-derived dye. Nogueira says she was surprised by how efficiently their manufactured dyes were taken up by the fish. It’s not yet known why the tomatoes are such an effective way to color the fish, says Paul Fraser, a biochemist at Royal Holloway and Nogueira’s supervisor. But the advance reduces the cost of dying fish and “makes the whole process a lot easier and more sustainable,” he says. For now, Fraser and Nogueira’s role in this research is at an end. With the basic concept proved, Fraser says it’s now up to other industrial parties and research institutions to take it further. The future of fish farming is still in flux. But whether you think a future where farmed fish get their delicious color from eating genetically modified tomatoes enhanced with bacteria genes is dystopian or wonderfully novel, that may be the future you get. 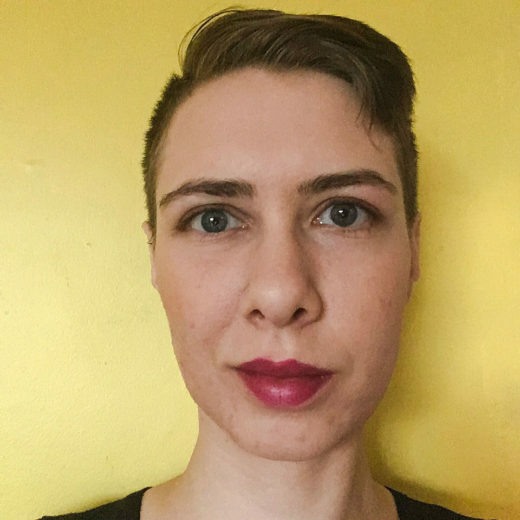 Kat Eschner is a Toronto-based freelance journalist whose work on science, history, and cities can be found in publications like Smithsonian.com, the Globe and Mail, and Spacing. Cite this Article: Kat Eschner “Genetically Modified Tomatoes Give Fish a Futuristic Hue,” Hakai Magazine, Jul 3, 2018, accessed April 26th, 2019, https://www.hakaimagazine.com/news/genetically-modified-tomatoes-give-fish-a-futuristic-hue/.